Colombia has been on a massive political and emotional roller coaster. A peace accord to end the 52 years civil war was signed on 26 September. It was a peace accord that Colombians then rejected in a referendum on 2 October. Then a few days later President Juan Manuel Santos — whose referendum was rejected — became the recipient of the 2016 Nobel Peace. All of this happened not in a hundred years, but in the space of just a few weeks. Let's start with the referendum. For those who know a bit about Latin American politics the defeat of Santos in the referendum was — paraphrasing the Colombian 1982 Nobel Literature Prize Gabriel Garcia Marquez — a chronicle of a defeat foretold. It was not unexpected. The success rate of Latin American referendums, called by the executive, is below 55 per cent. Last March Bolivia's Evo Morales, in a quest for a fourth term in office, lost his own referendum despite his massive popularity. Guatemala's 1999 referendum to introduce major constitutional reforms, held three years after the peace agreement that ended the civil war, was rejected by 91.8 per cent of voters. And even the referendum designed 'not to be lost' by the former Chilean dictator General Pinochet bit the dust when the 'no' option ended his rule in 1989. So while the result of Colombia's referendum was not a shock, it has produced anxiety. During this roller coaster week, Colombians had a well-deserved reprieve when the national soccer team defeated Paraguay one-nil in the 2018 world cup qualifier. If football, the most popular sport in Colombia, can be used as a metaphor, one might say that after the referendum, the peace process has headed into extra time. In football's extra time, usually played after an inconclusive 90 minutes, the team able to maintain calm and find a new burst of energy will probably win. And this is exactly what the peace process has been injected with — calm and new energy — after Santos was awarded the Nobel Peace Prize. 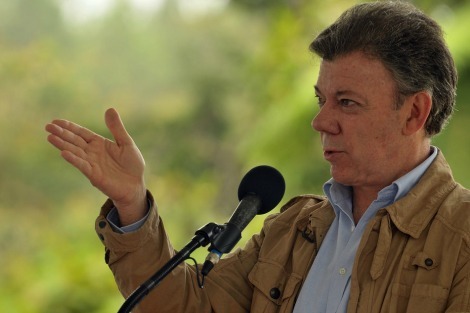 "In order to the end the conflict Colombians have to be persuaded that peace is not a hollow concept. It will be a challenge to persuade the skeptics, despite the substantial decrease in violence over the last few months." The prize has stretched international support for Santos and has left those opposing the peace process — primarily former president Álvaro Uribe — in a state of solitude. Uribe, whose return to the political limelight was short-lived after the triumph of 'no' in last week's referendum, is a warmonger whose thesis about the total military defeat of the FARC has been proven to be utterly unfeasible. Of course this doesn't mean that Uribe — whom was once described by Colombian writer Héctor Abad Faciolince as a political 'arsonist' — will end his campaign to boycott the peace process. Uribe is not interested in ending the conflict. He seeks to prolong it and to place it at the heart of his likely 2018 presidential campaign. As in a football match when the odds are in your favour, Santos and Rodrigo 'Timochenko' Londoño, the leader of the FARC, went on the offensive. They met Jean Arnault, the head of the UN mission in Colombia, and signed a protocol to secure the bilateral ceasefire signed on 23 June. The protocol was agreed three days after Santos extended the end of hostilities to 31 October. These two maneuvers are hugely important for the success of the new round of negotiations. With his international reputation enhanced after winning the Nobel Prize, Santos has committed to consider the demands expressed by those who voted 'no' to the peace agreement. He won't, however, go back to square one. He will make, as he said, 'adjustments' to the original proposal. What is not clear yet is what the adjustments will be. What is clear is that Santos and Timochenko have less than a month to come up with something that will appeal to at least 75 per cent of Colombian voters. The referendum's low turnout last week — only 37.29 per cent — was not a political defeat for Santos. On the contrary it could be constructed as a useful event that reminds him, and those fighting to the end the 52 year war, that in order to the end the conflict Colombians have to be persuaded that peace is not a hollow concept. It will be a challenge to persuade the skeptics, despite the substantial decrease in violence over the last few months. That is not a minor thing for a country that has been up to its neck in blood. It is fortunate indeed that we have this excellent article in Eureka Street from a perfectly bilingual Latin American. Thank you, Antonio. For too long we have been reading about the real and the perceived problems of Latin America from a primarily North American viewpoint which is heavy with cultural baggage and not really simpatico to the region and its inhabitants. Australian ignorance of Latin America is dreadful, which is a real pity, because some of the best literature and most relevant and alive Catholicism comes out of there. Knowing a wee bit about Colombia and having met some Colombians I can only hope and pray peace descends on the nation and the scheming of those like Uribe is confounded. When the dust settles next year, maybe LGBTI advocates will see the wisdom in trying to convince the Labor party to reinstitute a free conscience vote on its side if only to force the Coalition to do the same. That way the parliament a few years down the track might be able to do what the LGBTI advocates want them to do now. If it were my call, I would have opted for the plebiscite in February with prompt parliamentary legislation to follow. But it's not my call. You'd swear, from men's outrage in response to Trump's remarks, that such behaviour is rare, committed only by the truly reprobate and swiftly condemned. But, no: the volume of assault and harassment stories shared on Twitter with the hashtag #notokay, 27 million by Monday afternoon, prove that sexual assault and harassment is common. If women in their millions are relating their experiences of sexual harassment and assault, there must be men in their millions committing these crimes.